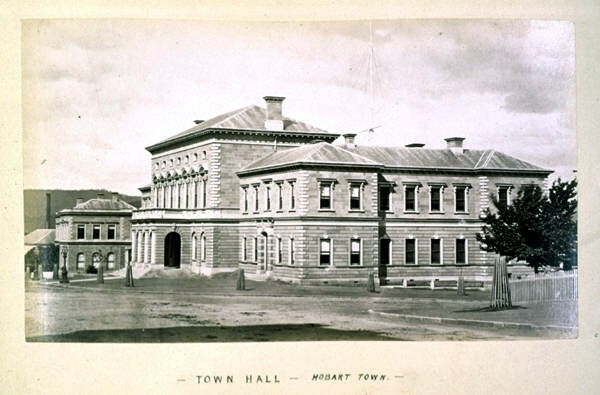 Hobart Town Hall (Tasmania), opened in 1864. Photo © KLW NFC 2008 ARR. 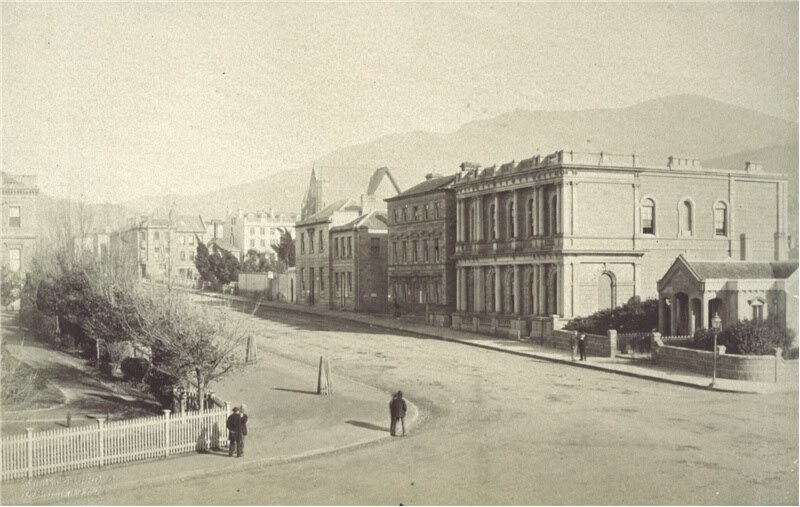 On a dry Spring afternoon, a day or so before 19th September, 1879, a reporter at The Mercury newspaper office looked out his window and across the street to the Hobart Town Hall, sized up the state of the saplings struggling to survive in front of the portico, and sat down to pen a vituperative paragraph about the “caretaker” who, he insinuated, considered himself above a task as trivial as watering the trees. 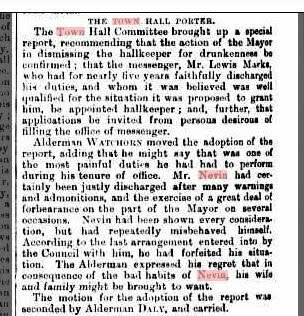 The reporter used the term “caretaker”, not “keeper” or “Hall-keeper” which was the official and initial designation when Nevin won the position over 24 candidates in late 1875. The caretaker’s job may have been distinct from the Keeper’s, but if that were the case, a caretaker as gardener would not be a worthy target of such scarifying criticism. The Keeper, however, was a different matter, especially when the Keeper was also a photographer of ten years’ standing, and a valued police associate. The term “Keeper” is an archaic position title still in use in museums and public records offices which denotes a keeper of records and archives. 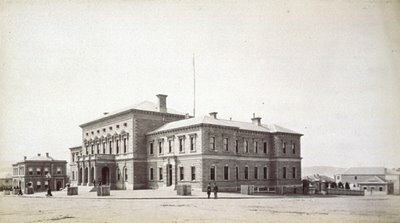 By 1878, Nevin was also the Office Keeper for the Mayor’s Court and Hobart City Corporation. A few of the chestnut trees that were some time ago planted on the footpaths around the Town Hall are determined, in spite of adverse circumstances, to keep in existence – but only a few. 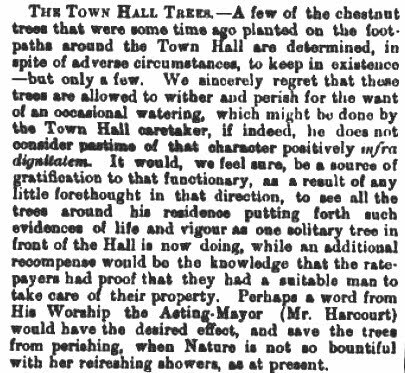 We sincerely regret that these trees are allowed to wither and perish for the want of an occasional watering, which might be done by the Town Hall caretaker, if indeed, he does not consider pastime of that character positively infra dignitatem. It would, we feel sure, be a source of gratification to that functionary, as a result of any little forethought in that direction, to see all the trees around his residence putting forth such evidence of life and vigour as one solitary tree in front of the Hall is now doing, while an additional recompense would be the knowledge that the rate-payers had proof that they had a suitable man to take care of their property. Perhaps a word from His Worship the Acting-Mayor (Mr. Harcourt) would have the desired effect, and save the trees from perishing, when Nature is not so bountiful with her refreshing showers, as at present. 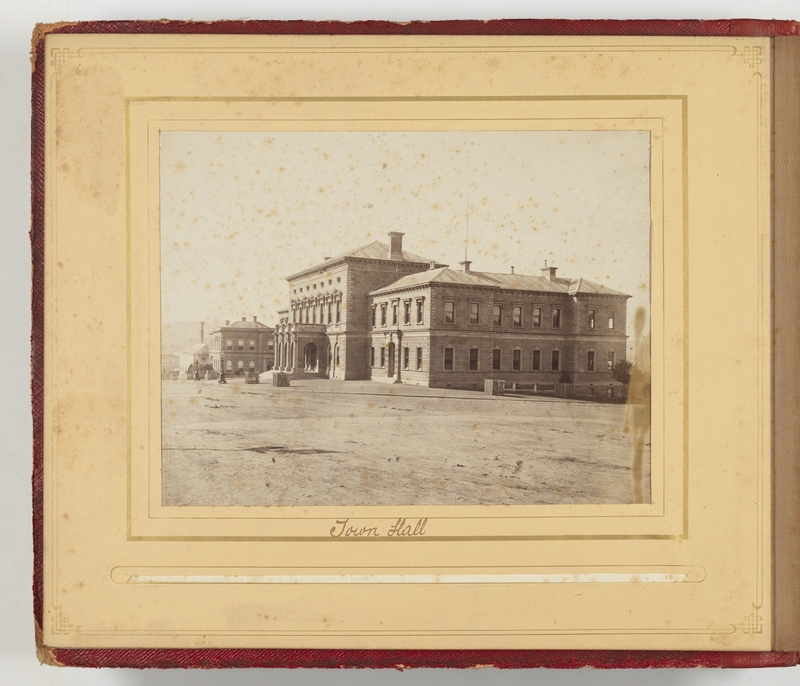 These photographs (detailed) were taken of the Town Hall about the same time. No date, possibly 1876-80, unattributed, half of stereo? This figure may well have been Nevin, watched by the reporter, or someone Nevin was photographing, informally. Views of Tasmania, ca. 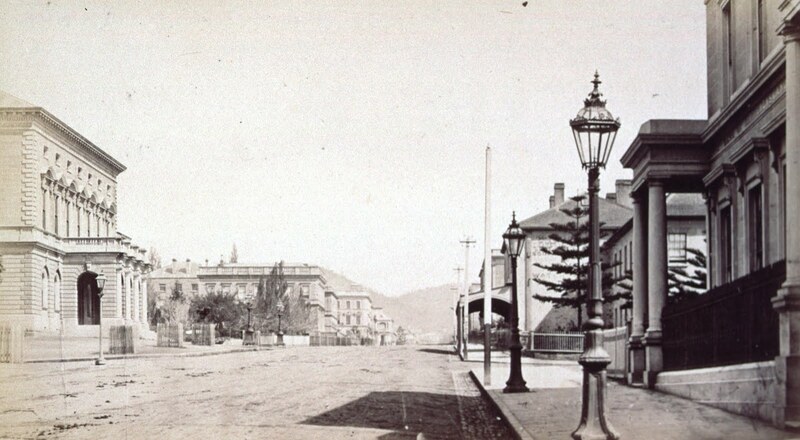 1879-1885 / photographs by Anson Bros.
Picket fence tree boxes but no trees, 1878, in front of the Hobart Town Hall. Below: one fragile sapling in the middle box (?) ca. 1879. Above: detail of the photographs (see below). Tasmania may well have experienced drought in the year 1879, an event which would have been much less obvious to the population than drought is to us now. The Mercury reporters by September 1879 had published several attacks on the mismanagement of the Town Hall by the City Corporation, some specifically directed at Superintendent Richard Propsting working from The Municipal Police Office housed within the building. The attacks centred on his lack of action in controlling the Chiniquy riots which took place there in June 1879. 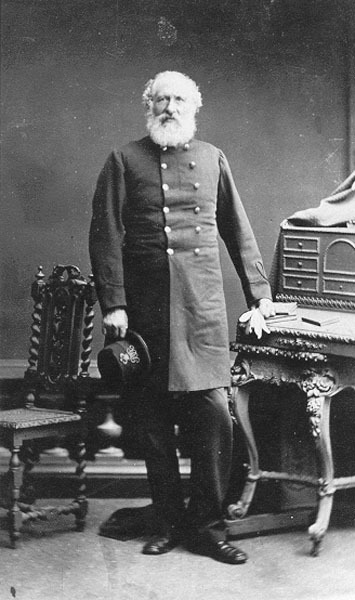 Thomas Nevin as both the Hall keeper, Office Keeper and a special constable sworn in 28 June 1879 was also a primary target for criticism, though both men were not without their supporters. 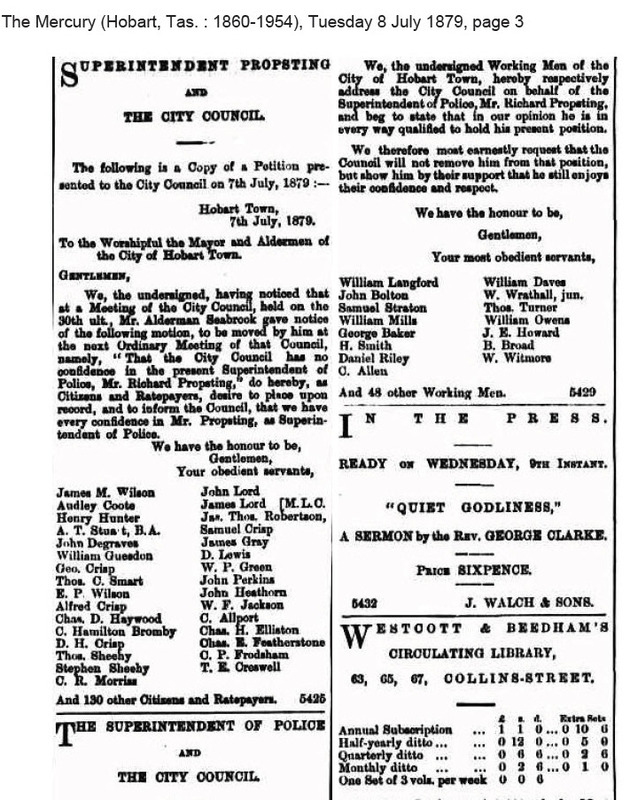 This pledge of support expressing total confidence in Superintendent Propsting appeared in The Mercury on 8th July 1879. A few months later, Richard Propsting resigned. Nevin was the continued target of attack, resulting in his dismissal from the position of Town Hall caretaker in December 1880, though retained as police photographer by the Municipal Police Office for another decade. Below: Supt Richard Propsting, 1879. Above: Nevin’s dismissal reported in The Mercury, 8 December 1880. 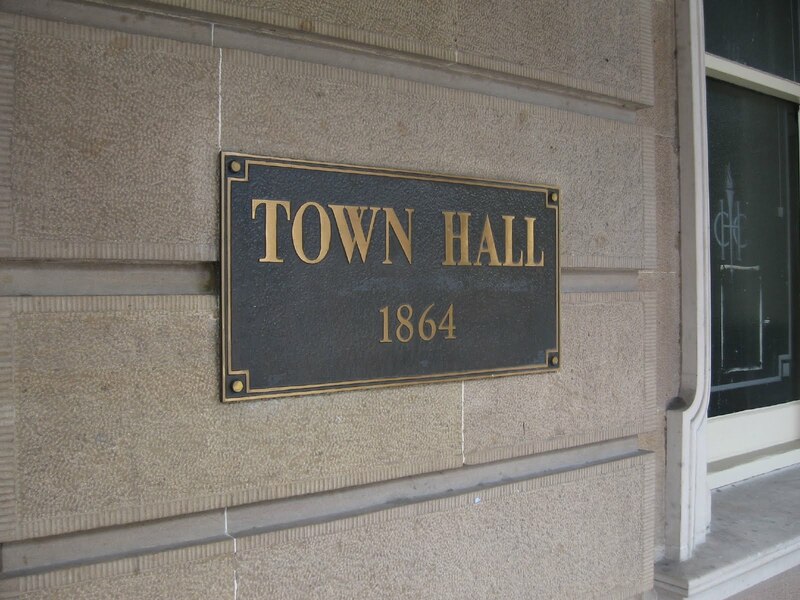 The Town Hall Keeper position was not well-paid nor in any respect especially important in any case. The salary in 1875 when Nevin was appointed was “30 shillings per week with free quarters, fuel and light“. Nevin left the job probably relieved of the opportunity to resume his photographic career with his friend, commercial photographer H.H. Baily, and concentrate on his other interests which were more financially rewarding. NEVIN’s VIEW of The Mercury Offices across the street from the upstairs rooms at the Town Hall. His residency lasted five years (1876-1880). 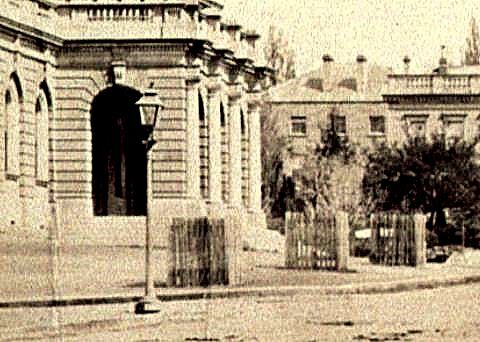 These photographs reveal that trees in front of the Town Hall did not exist in 1875 when Nevin was appointed Keeper. To expect saplings to be full-grown chestnuts by mid 1879 was an absurd criticism to level at the caretaker, and indicative that the real reason for the reporter’s criticism was not the state of the trees but the caretaker himself as a man with an infra dignitatem attitude. No trees in front of the Town Hall in this view from the Town Hall fence towards The Mercury Offices. 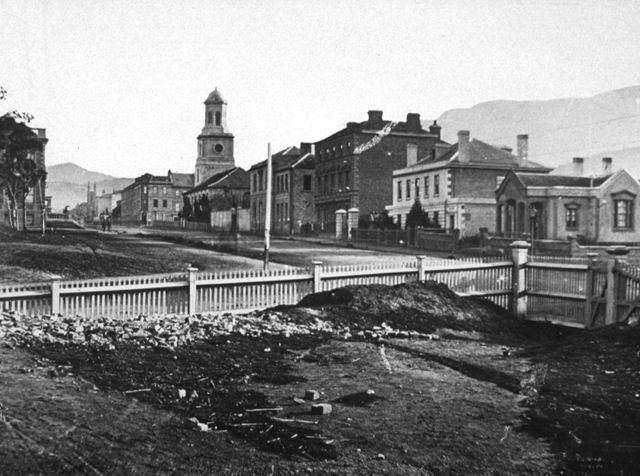 The fence of the site of the Hobart Town Hall ca. 1860. Still no trees in front of the Town Hall in this view attributed to H.H. Baily. Fenced tree boxes but no trees in front of the Town Hall. This view and the one below are attributed to the Anson Brothers. Description: 1 photograph : sepia toned ; 105 X 180 mm. Notes: View taken from the corner of Macquarie and Elizabeth Streets.